Supply chain companies can leverage AI-powered software to drive efficiency, innovation, and results in the e-commerce era. When today’s consumers order a product online, they expect it to be customizable, trackable, and to arrive promptly. These demands are driven by the e-commerce boom, which eMarketer reports generated $2.304 trillion in retail sales worldwide in 2017, and, according to the Department of Commerce, makes up nearly 10 percent of retail sales in the U.S.
That means big pressure for supply chain companies—and big changes. The question is, how can logistics centers react nimbly to these demands? It can be hard to cost-effectively revamp an industry that’s so grounded in the physical world. The answer lies in a software-centric approach powered by artificial intelligence (AI). Hardware is only as effective as the software behind it—and the beauty of software is that it can be upgraded continually. Even better, AI-powered software delivers advanced operational optimizations, such as predicting seasonal trends or re-allocating workers to maximize output. The potential benefits are sizable: Gartner predicts that by 2021, AI augmentation will create $2.9 trillion in business value and recover 6.2 billion hours of worker productivity. In this era of disruptive technology, it’s no surprise that supply chain companies are weathering a sea change. From blockchain to the Internet of Things to advanced analytics, a barrage of new technologies are coming forward, each in a different state of readiness, and each with a different set of abilities to face the myriad challenges of e-commerce. That puts logistics centers in a bind: with the outcomes unclear, what technology will best keep up with increasing demands for greater product complexity, shorter delivery cycles, and mass customization? Some companies are tempted to wait and see, and rely on outdated computer programs or legacy systems in the meantime. Part of their concern may be the investment involved in uprooting the status quo (despite the expense of maintaining decades-old systems, which often require more manual labor). But the truth is, legacy systems aren’t even a stopgap. They can’t provide fast turnaround for omni-channel, high-volume e-commerce needs. And in today’s ever-evolving market, if you’re not racing ahead, you’re falling behind. The good news is you don’t have to replace your system in one go. With modular software, you can upgrade a section at a time. The great news is this process doesn’t take long. The automotive industry took 30 years to undergo a digital transformation, but now fulfillment centers can do so speedily because the software’s more mature. The best news? Intelligent software not only solves the problems you give it, but can also identify additional optimizations for you, such as rerouting shipments around weather delays. Intelligent software can help your company stay agile by enhancing flexibility and configurability; accuracy and speed; ease of use and deployment; cost reduction; real-time decision making; and the ability to change tasks quickly. Often times, intelligent software can provide solutions to issues that humans may not think of and alleviate issues before they arise. Imagine that you’re in the middle of loading orders, but an emergency request comes in with a two-hour delivery window—an increasingly ubiquitous demand in e-commerce markets. A company without an intelligent system would have to tackle that challenge manually. But AI-powered robots can move an emergency request ahead in the queue, so even if you’re in the middle of loading 1,000 orders, it will prioritize urgent orders in the sequence currently being processed without missing a beat. Nitori, Japan’s largest home furnishing chain, faces many issues common to supply chain businesses: customers ordering fewer items at a time, and more frequently; an expectation of faster delivery to more localized places; and growing stock keeping unit (SKU) variability coupled with greater order volumes. All these pain points result in the need to scale up while maintaining flexibility. Intelligent software can expedite express orders and adjust operations for changing business needs. With their newly implemented system from GreyOrange, Nitori anticipates a throughput gain of more than 400 percent from its Osaka fulfillment center. Ready to upgrade? Figure out what your needs are—for example, modular software, which are flexible and scalable allowing companies to be agile and adaptable—and who can meet them. Look for a partner that will work closely with you at every step; they may have ideas for improving productivity in places you hadn’t thought of. The best partner will have a vision for the future and can help you reach that next milestone when the time comes. Intelligent software can also help with internal business functions by lowering employee attrition rates, because it requires more engaging skills and often leads to better pay. Start training workers now. Gartner predicts that by 2021, three out of five factory-level AI initiatives in large global companies will stall because of a lack of talent. Solutions require little training as processes are intuitive and fast for workers to adapt, this may also alleviate concerns about job security. While some logistics companies are hesitating, early-adopters are already reaping the rewards of AI-powered software: optimized operations, adaptability to changing business needs, and real-time intelligent decisions. But remember, these systems move quickly. Investing now in an intelligent system won’t just let you keep up with the competition—it’ll help you blow them away. 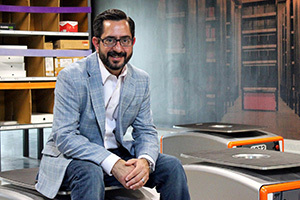 Chris Barber is the CEO, North America of GreyOrange, a global leader in AI-powered software and robotics technologies for operating flexible automated fulfillment centers. Barber oversees the expansion of GreyOrange within the U.S., bringing supply chain innovation and streamlined solutions powered by AI to e-commerce, retail and logistics customers. GreyOrange has become the world’s largest supply chain automation company, following its rapid expansion in recent years into Asia-Pacific, Europe, and the Americas. Click here to contact GreyOrange and learn more about GreyMatter, an intelligent software platform designed to optimize fulfillment center operations.